Whether you’re the type of person to binge watch eight episodes of reality TV or the type to stand in line for eight hours for the new iPhone release, we all have strong personal interests that make us who we are. These interests and personality traits also manifest themselves through our online activity and digital footprint, creating a virtual persona of our real selves. 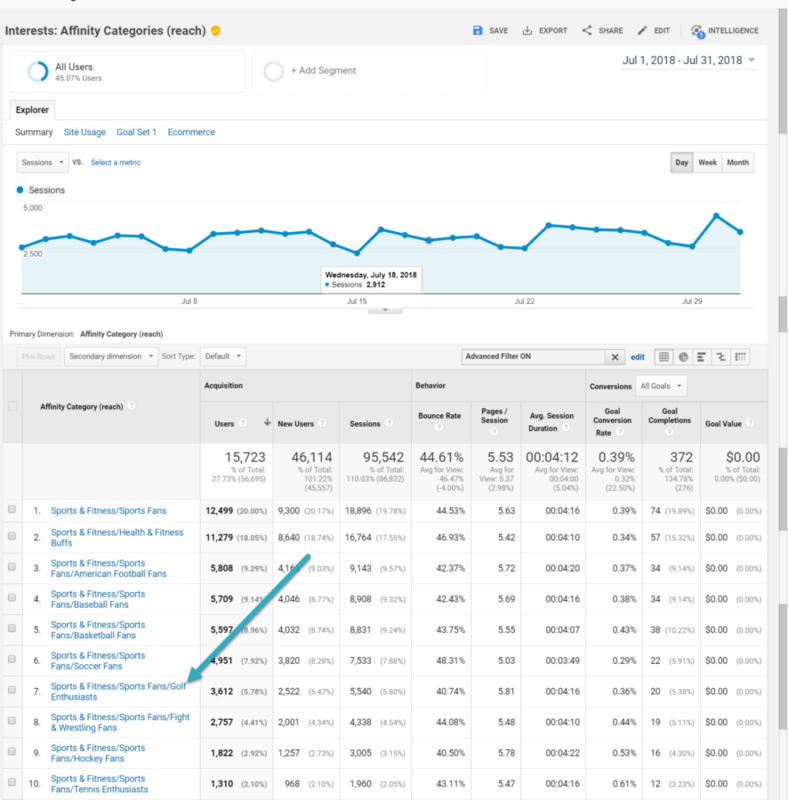 Our digital doppelgangers are neatly classified in Google Analytics as Affinity Categories and In-Market Audiences, as well as in the various audience insights tools in the backend of social media channels. This data that we leave behind in the form of browser history and online behavior influences what ads we see and when we see them. Paid Search and Paid Social specialists utilize this information every day to target ads, and in theory, cater to our personal interests and needs (even if we don’t really need that new pair of sneakers, per se). 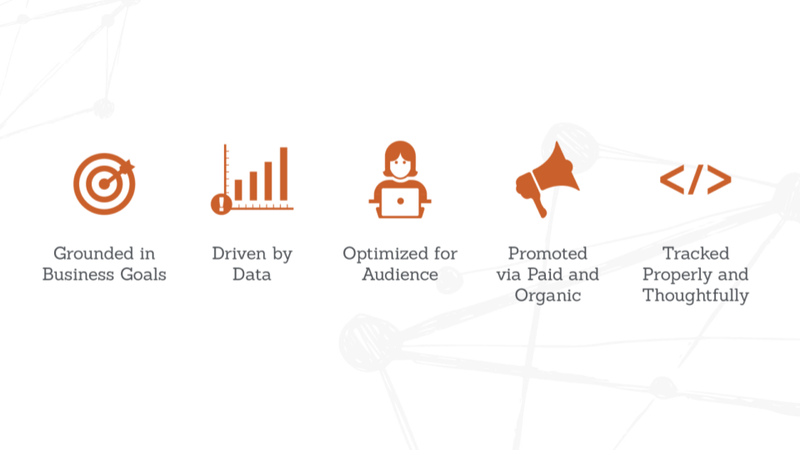 But this data isn’t just meant for advertising purposes. By tying these interests into content and PR strategies, there’s an opportunity to better understand your target audiences and eventually reach them through organic search. To start off, it’s important to know the difference between the in-market audiences and affinity categories. Per Google, in-market audiences allow marketers to “connect with those most interested in what we have to offer, using precise segments that classify users based on their demonstrated in-market behavior and purchase intent”. These audiences are identified by Google based on browser history and the types of ads that have been clicked. Because these users already show high intent of purchase, it’s possible to see sky-high conversion rates and purchases when using this data to retarget. Example categories include Apparel & Accessories, Autos & Vehicles, Real Estate, Baby & Children’s Products, Beauty Products & Services, Consumer Electronics, and so on. There are over 80 unique personas based on lifestyle and interests displayed in this particular Google Analytics report, including Gamers, Cooking Enthusiasts, Music Lovers, Sports Fans, etc. It goes even deeper in some categories. For example, a Music Lover could be further identified as a Blues Fan, Classical Music Enthusiast, or Metalhead. Our cigar-retailer client was looking to establish partnerships with cigar and related industry bloggers. By cultivating ongoing relationships with bloggers, our overarching goal was to build brand awareness in the industry and increase referral traffic from relevant sources. After working with several cigar bloggers and low-hanging fruit sites, we needed to diversify our strategy and move outside the cigar-specific realm. Where else is our audience spending time? To find this, we started with analyzing our top 10 categories or segments, and then began digging into them to see the specifics of the category. For our particular client, affinity categories seemed to be more insightful and lended themselves well to our client’s offering. However, you may find the inverse with in-market segments – it’s all about what insights you can glean from the data. Ideate and develop content for our client’s blog. For simplicity’s sake, I’ve broken these two strategies into their own sections but keep in mind that they are not mutually exclusive. More on that later. Once you have your data and understand your customers’ interests, you’re ready to get rolling with identifying sites that align with your findings. You’ll notice that the number one category in our affinity categories for our cigar retailer client is Value Shoppers. This wasn’t shocking to us, since this particular client offers several different deals on their cigar inventory each month. Seeing this, we devised a promotional strategy that involved identifying several digital coupon sites like www.coupons.com and www.couponcabin.com that may be interested in promoting our client’s deals. We not only gained link equity from those sites, but we also increased our client’s brand awareness to net new, budget-conscious audiences who may not have known about the brand before or who might not have purchased without that code. Paid media through sponsoring content is another way to put your public relations hat on and boost your client’s name through new outlets. Another example is business professionals, who are number two on our list of top affinity categories. We then layered on the fact that males ages 24-54 makeup 53% of our target audience. While that’s a broad age range, there is an assumption that the men in this range are still likely to be business professionals. We pursued blogs and sites that catered to these two traits, and found our sweet spot with lifestyle-focused blogs that offered insightful advice and how-to’s for men, like Primer Magazine. Of which, we sponsored a piece of content that highlighted our client’s product while also remaining educational. In the month of its launch, the article drove 700 sessions and generated nearly $500 in revenue, indicating that we had reached our business professional audience and the content resonated with them. Disclaimer: Don’t fall victim to Google’s penalty for paying for these links. Try to diversify these opportunities with nofollow and dofollow links. When focusing on content ideation for a blog or resource center on your site, you can use audience interests to get creative and develop out-of-the-box content. One of our top affinity categories was Sports Fans. When digging in deeper to that category, we found that many are specifically fans of golf. We all know that hitting the links and lighting up a cigar go hand-in-hand, so we developed content that recommended the best types of cigars for a summer day on the course. In this instance, promotion and content develop becomes symbiotic, primarily through contributing guest content. By utilizing these audience interests to inform keyword research and content development, you can then prospect and conduct outreach to sites that accept guest posts in order to kill two birds with one stone. By using advanced search queries like “Write for us” men’s lifestyle” we uncovered several relevant men’s lifestyle blogs and sites to whom we could contribute content. This is especially useful for clients with limited budget, because those sponsored posts do not come cheap. 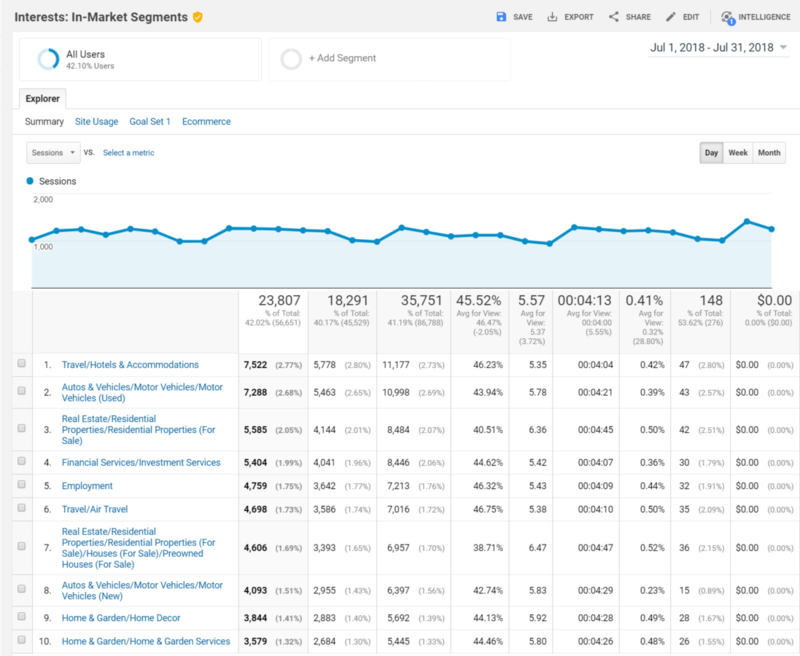 While this isn’t necessarily the newest trend in SEO, there are several Google Analytics reports that get lost in the shuffle but hold really useful insights that can inform your day-to-day strategies. What are some other ways that you’ve used this data?